I hear her voice in the mornin' hour as she calls me, The radio reminds me of my home far away. And drivin' down the road i get a feelin', That i should have been home yesterday, yesterday. What are Spice and Rowdy's cutie marks gonna look like? And I thought Icy didn't want to be like his brother? I would say the CMC kids are popular. Family and friends with hero's and such. EDIT: Oh, it's Power Puff. Damn. Icy: Hey pixel wanna hang with us? Icy: oh c'mon pix we're gonna do something cool and I want you to join and besides you have chance to be popular. Icy: I'm gonna see a movie. who's with me? Later at the cmc clubhouse. i got the ref! in fact when i first headr of snips and snails im like..... wait, no dogtail? She just wants to be like the cool kids,cause all the cool kids they seem to fit in~T.S. wicked fan detector VIP VIP VIP! YAY! With those guys, sweetie? Really? I was wondering lately, do you plan to make profiles of Rowdy, Spice and Power Puff in the future? Can I turn this into a base? Oh ok :3 do you still let people make a picture with one of yours if they credit you? Oh, its alright....Thank you for your time! 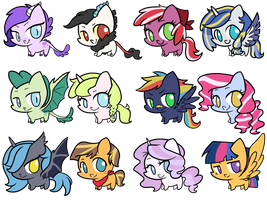 and the last cutie mark i mean that's so awesome. Echo: WHY DID YOU GO WITH THEM?!?! Pixel!? C'mon, you're head may be gorgeous, but there is nothing inside it. Pixel: "But Api...Icy promised he has all the best video games..."
Api: He's a big fat meanie pants who lies! this reminds me of Babs seed .